"A clear understanding of the customer’s journey is now a marketing performance management imperative,” said Jerry Rackley, Chief Analyst at Demand Metric. 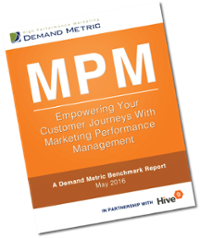 Hive9, the marketing performance management company, and Demand Metric, a research and advisory firm, today announced the availability of a new research report called “Empowering Your Customer Journeys With Marketing Performance Management”. The complimentary report is available on Hive9’s website. 89 percent of top-performing marketing organizations set quantifiable performance targets for many or nearly all their programs. Top-performing marketers are better at understanding and measuring the customer experience. On a scale from 1-10 where 10 = extremely effective, the Best rate 7.9; the Rest rate 5.7. Top-performing marketers more effectively optimize content for the stages of the buying journey: the Best marketers rate 7.4, while the Rest rate 5.3 where 10 = extremely effective. “Marketing and customer experience continue to drift closer to one another so that the alignment between marketing and customer experience has become just as important as marketing and sales alignment. A clear understanding of the customer’s journey is now a marketing performance management imperative,” said Jerry Rackley, Chief Analyst at Demand Metric. “Understanding the customer’s journey is an integral part of measuring and improving marketing performance. Hive9 brings together data from multiple silos to create actionable intelligence that improves the customer experience. We are excited about the combination with our planning, budgeting and attribution solutions to provide a complete picture to marketing leaders, who are on their own journey to increase their business impact,” said Darin Hicks, Hive9’s CEO. Hive9’s automated journey mapping solution uses millions of marketing and sales touch points to visualize and analyze the actual buyer and customer journeys that lead to greater revenue and more customer advocates. In addition, with built-in tag management and next-best message rules, Hive9 helps marketers put proven messages, assets, and sequences into play, driving more prospects onto the desired path. Demand Metric is a marketing research and advisory firm serving a membership community of over 80,000 marketing professionals and consultants in 75 countries. Offering consulting methodologies, advisory services, and 500+ premium marketing tools and templates, Demand Metric resources and expertise help the marketing community plan more efficiently and effectively, answer the difficult questions about their work with authority and conviction and complete marketing projects more quickly and with greater confidence, boosting the respect of the marketing team and making it easier to justify resources the team needs to succeed. To learn more about Demand Metric, please visit: http://www.demandmetric.com. Hive9 is the marketing performance management company. B2B CMOs, demand gen leaders and marketing operations experts rely on Hive9’s cloud-based solution to get one view of all plans and budgets tied to pipeline and revenue performance, optimize the full customer experience, and measure what matters to get real-time visibility that drives action and results. Unlike static spreadsheets and disparate, out-of-sync tools, Hive9 predicts and improves the impact of marketing and provides always-on intelligence with connections to leading CRM, marketing automation, finance, and project management systems. Hive9 customers include Zebra Technologies, Thomson Reuters, MongoDB and Sage Software, and the company is based in Austin, Texas. To learn more, visit http://www.hive9.com or follow @hivenine on twitter.